Attorney Leonard A. Bellavia has dedicated his career to fighting for the rights of US automobile dealers and franchise owners. Now, he wants to take that fight to the US Treasury Department – who Bellavia believes participated in legal misconduct by ordering the closing of 789 Chrysler Dealerships as part of the Chrysler Bankruptcy in 2009. The 27 GM dealers who did not sign wind-down agreements are also eligible to participate in this lawsuit. To file this lawsuit and move this fight forward, Bellavia needs a threshold number of dealers to participate. He’s almost there. But, the law firm still needs more dealers to join the fight. Buoyed by recent headlines about a potential probe of the US Government’s role in setting criteria that resulted in the loss of franchises by GM and Chrysler dealers, Bellavia is reaching out far and wide to auto dealers. “If the Executive Branch of the US Government exceeded its authority by mandating that dealers be closed, then the Government should be held accountable by the dealers” Bellavia said. This is the United States of America, noted Bellavia, and people have property rights that should not be violated. Dealers need to stand up and seek retribution for the severe economic loss the US Government may have caused them and Bellavia Gentile & Associates has developed a model that makes this feasible. “We are trying to reach as many former Chrysler and eligible GM Dealers as possible to let them know of this opportunity. Using the learning curve of our law firm – which represented the highest number of Chrysler dealers in arbitration hearings (according to our information) – and calling upon my personal knowledge gained by cross examining key people at Chrysler – including Bob Nardelli, Jim Press, Peter Grady and John Tangeman – these dealers have a solid chance of getting just compensation for the loss of their dealerships” said Leonard A. Bellavia, Esq. 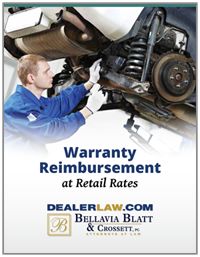 Former Chrysler and eligible GM Dealers who want more information about joining this lawsuit can email Leonard Bellavia at LBellavia@DealerLaw.com or call the firm at 516.873.3000.